8 Cylinder Engine 5.0L/305. 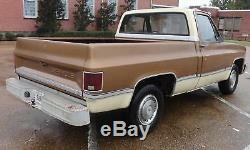 1981 CHEVROLET C10 CUSTOM DELUXE. NEW THERMOSTAT & COOLANT FLUSH. WATCH THE VIDEO IN 720 HIGH DEF! 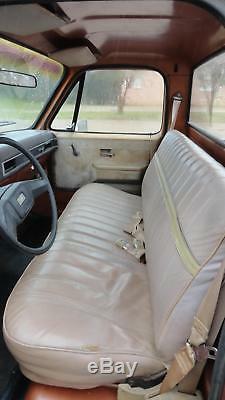 1981 Chevrolet C10 Custom Deluxe Test Drive. Video will open in a new window. Just when you think the supply of clean, unmolested square bodies has dried up, something like this pops up. 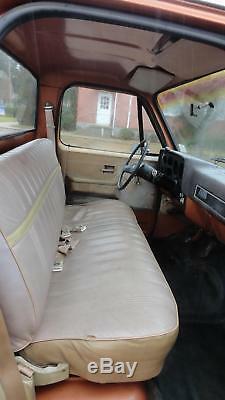 This 1981 Chevrolet C10 Custom Deluxe is as stock and original as they come. 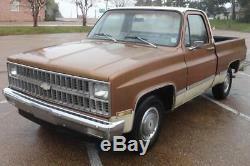 He bought this truck brand new back in'81 and it even comes with the original Mississippi title. It has spent its entire life here in central Mississippi since new. He was a traveling preacher who split driving time between this truck and a'72 Olds 98. It had been sitting about a year, so I did a few things to get it up to speed. It has a new master cylinder, new thermostat & radiator flush, new lifetime starter, new battery, etc. The tires were changed just a few years ago. I cannot find anything that doesn't work on this truck other than the air blows but isn't cold. The 5.0 V8 fires right up with the tap of the key and doesn't make any weird noises. It has a spray-in bedliner and the inside of the bed is arrow straight. It's not rusted out either. He mostly used this truck for his woodworking hobby but it has been garage kept for most of its life. With only 61k miles, it's not even broken-in yet! Personally, I would just leave it like it sits and enjoy it but it's a solid base for whatever kind of project you choose to undertake. Most square body short beds nowadays are either ate up with rust or customized to someone else's (usually) questionable taste. Please be aware that we are NOT PERFECT. We go to great lengths to make sure our ads are correct, BUT occasionally we do make a mistake. No allowance or set aside will be made on account of any incorrectness, imperfection, defect or damage. Folks, we don't mean to sound harsh, but we do sell used vehicles. We will make every reasonable effort to describe the vehicle, and we include many photos to assist in that effort. However, it is important to remember that these vehicles are pre-owned, not brand new. Therefore, minor items such as cigarette lighters, manuals, CD changer magazines, keyless entry remotes, etc. And, as with any used vehicle, minor signs of wear may become apparent under close inspection. This may include small chips, light scratches or minor abrasions, wheel scuffs, and other indications of normal wear and tear. We cannot and will not be held liable or responsible for these issues. We Sell At Below-Wholesale Prices And Cannot Provide Spare Keys Or Floor Mats Unless They Are Already With A Vehicle. We say this for the simple fact that once you leave then what happens hundreds of miles down the road is out of our control. We do our best to make all our vehicles road-ready. In most cases we have already driven them 4-800 miles ourselves. Bank to Bank Wire Transfer. We handwrite every single description. We provide 24+ high resolution pictures & we inspect and photo what you see and what you can't see. People ask us all the time what is the catch to our vehicles. They assume that the prices are low because there is something wrong with them. Nothing could be further from the truth! We are an internet-only dealer. We do not maintain regular office hours or a large sales facility. We simply have a Mississippi bonded dealer's license, a storage lot, and a computer. Since we don't have dozens of mechanics, helpers, salesmen, secretaries, etc. On our payroll; we are able to sell at greatly reduced prices. You will notice that we sometimes go with private auctions. In addition, we set our reserves to sell which upsets other sellers! We do this to avoid the. We've put this vehicle through our EXTENSIVE inspection process & can report it has a great ride & drive! There are some small bubbles here & there but no major rust. We had half a dozen. We do have a BuyIt Now price so give us a call if you're interested. Don't be outbid at the last minute! Now for the rest of the fine print.. This is due to the large number of. Generally we have almost all titles on hand. On Average, Titles Go Out Within a Few Days, But Occasionally There May Be Delays Beyond Our Control. We can do this because most online shippers are not really shippers. We offer it solely as a service to our customers. If you prefer to fly in & drive home we'll be glad to pick you up at Jackson Internation Airport ("JAN"), the local Greyhound station, or the Amtrak Depot. Please arrange your flight times accordingly. We no longer will deliver vehicles after-hours or on weekends. Occasionally things pop up like a blown fuse or a headlight going out and after hours a mechanic isn't there to fix it. We will not be responsible for damage or theft while in storage here. If you are not sure about something, Please ASK. Do not assume anything not listed is included. We reserve the right to end the listing if the vehicle is no longer available for sale. This is how we make our living. However, we've sent hundreds of cars, trucks, and RVs all over the country without them & nobody has ever had an issue driving home. If you want one, LET US KNOW IN ADVANCE. We do not keep them on hand. The item "1981 Chevrolet C-10 Custom Deluxe" is in sale since Sunday, November 11, 2018. 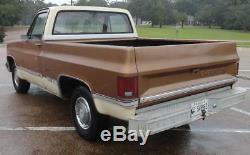 This item is in the category "eBay Motors\Cars & Trucks\Chevrolet\C-10". 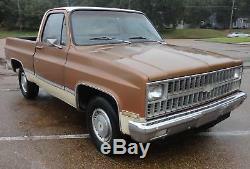 The seller is "tss-ms" and is located in Jackson, Mississippi. This item can be shipped to United States, Canada.